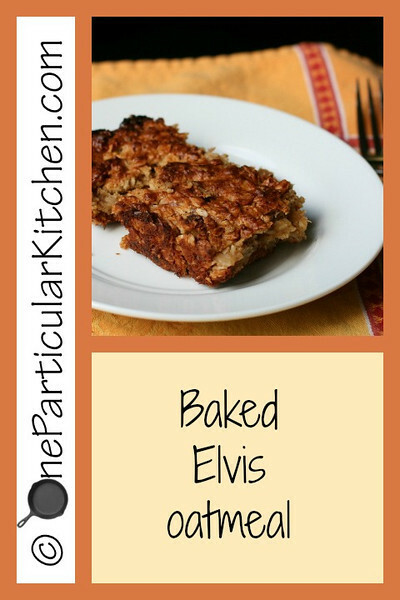 I’m not a stranger to baked oatmeal, but I love how Beth of Eat. Drink. Smile upped the ante with the addition of all her yummy fruit! I adapted her recipe a bit to use up what we had (super ripe bananas) and to add something both my kids are guaranteed to eat: peanut butter! Pour into a buttered 8-inch square baking dish, and bake at 375° for 25-30 minutes. This is such a great breakfast, and easy to keep around for snacks as well! Be sure to check out Beth’s original post for all her awesome fruit combinations, too. What fruits will you try with it? Oh pineapple! That sounds awesome! And I KNOW! I almost put chocolate chips in it but I (shockingly) refrained. Next time! I agree with the chocolate chips and I’d add bacon! You did say Elvis after all! This looks yummy. I’ve been wanting to bake oatmeal for a while. And don’t get me started on the banana/peanut butter combo. Mmmmmmm.